One of Dr. McIlwain’s main passions and research interests is supporting new music for the trombone. 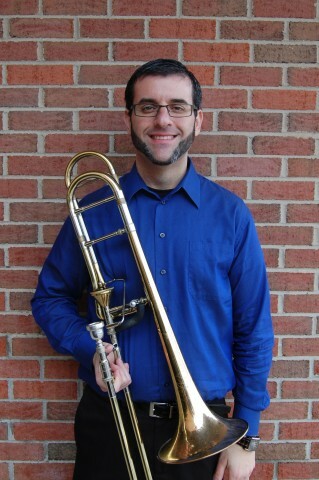 As of June 2014, Dr. McIlwain has commissioned nineteen new works for trombone solo and/or ensemble. This includes compositions for his group, Tromboteam, which successfully funded a Kickstarter.com campaign in 2012 that raised $10,000 for new works for trombone ensemble including composers James Kazik, Kevin McKee and Alan Theisen to name a few. Tromboteam is set to release their debut album containing all nine of these Kickstarter.com funded commissions in the fall of 2014. This recording is funded by a Scholarly and Creative Arts Grant provided by the College of Arts and Letters. After being awarded the Aubrey Keith Lucas and Ella Ginn Lucas Endowment for Faculty Excellence, Dr. McIlwain was able to fund a new concerto for trombone and orchestra by Russian composer, Polina Nazaykinskaya. In addition, the composer has agreed that this piece will be written in memory of McIlwain’s former student Gustavo Campos Cassemiro, who lost his battle with cancer on December 4, 2013. The title of this work will be: Concerto for Trombone and Orchestra, In Memoriam to Gustavo Campos Cassemiro. Premiere performances include with the Southern Miss Symphony Orchestra in February 2015 and with the U.S. Pershing’s Own at the American Trombone Workshop in March 2015. In addition to these commissioning and performance opportunities, Dr. McIlwain has been active in service to the International Trombone Association. The President of the International Trombone Association, Jiggs Whigham, appointed him, Director of TAPAS. This newly-formed project (Trombone Artists Performing for Amateurs and Students) aims to double the membership of the ITA over the next two years through a heavy marketing campaign. Also, Dr. McIlwain serves as a coordinator for the state (US) and international representatives of TAPAS. At Southern Miss, Dr. McIlwain directs all aspects of the trombone studio including The Southern Miss Trombone Choir and Hub Bones (jazz trombone ensemble). The Southern Miss Trombone Choir was invited to perform twice at the 2013 International Trombone Festival in Columbus, GA. He is also a member of the Southern Arts Brass Quintet, the faculty brass quintet at Southern Miss. His primary teachers have included Dr. David Loucky, formerly of the St. Louis Symphony Orchestra, and Dr. Per Brevig, former Principal Trombonist of the Metropolitan Opera Orchestra, along with Dr. John Drew, professor of trombone at Florida State University. As a Presidential University Fellow at Florida State University, Dr. McIlwain was the first doctoral trombone student and one of two in the entire College of Music at FSU to ever receive this honor. The research for his doctoral treatise titled, “Select Contributions and Commissions in Solo Trombone Repertoire by Trombonist Innovator and Pioneer: Stuart Dempster,” consists of extensive interviews with Stuart Dempster and Pauline Oliveros, among others. He has published articles in the Grove Dictionary for Music and Musicians and the International Trombone Association Journal. Dr. McIlwain has also performed as a guest artist at the International Trombone Festival, the Eastern Trombone Workshop and Trombonapalooza. In addition to the Suggs Endowed Professorship and Lucas Award, Dr. McIlwain has also been awarded the Junior Faculty Creative Achievement Award and the College of Arts and Letters’ Junior Faculty of the Year Award at The University of Southern Mississippi. ©2019 Tromboteam! All rights reserved.